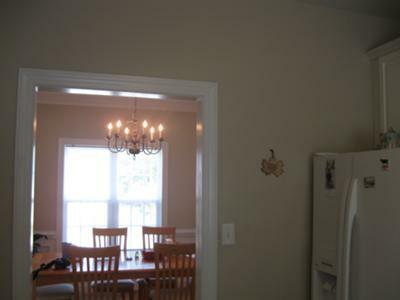 I'm looking to cover the walls of my kitchen perhaps with a green paint color. However, I am open to other color ideas. I have 4*4 Rialto beige tiles that were bought at Lowe's. My kitchen cabinets are white and the room at night can get pretty dark. 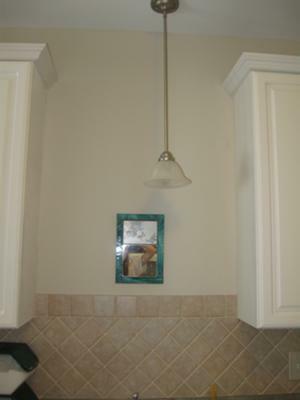 I have one overhead light in the main cooking area, with one pendent light over the sink. The "eat in" area has one chandelier. The mirror above the sink doesn't need to stay after I paint (it's just there until I find a better item). The hanging light is slightly off center, so it makes it a little hard to find a matching decor item to fit. It is a very open layout. 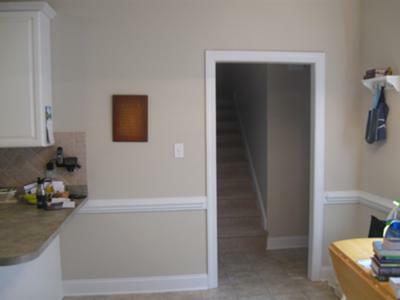 The kitchen leads into the dining room and living room. I have enjoyed the builders beige, but need a little color ideas since the builders beige is on all walls throughout the house. Greens are always a good choice for the kitchen, in my opinion. You mentioned the room can get a little dark at night (add more lights!) but it also doesn't look like a lot of natural daytime light either, so we need to try out a warmer green. - will help with the darkness. 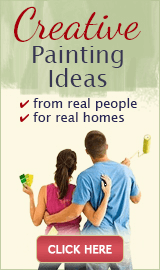 You need to be careful about getting too dark with your wall paint color, because the room is already dark. But of course, your white cabinets and trim help here. Green and red are complimentary colors - which means when they're next to each other, they bring out the best in each other, so greens will look a little greener next to red. Mesquite is a little brighter than the other greens I suggested, and if it works with the counter and backsplash, it would be a welcome change to the builders beige. 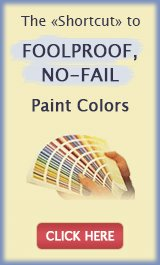 The ceiling should be a nice ceiling white in your case to combat the darkness - and if you're painting the ceiling... that will give you a chance to move the off-center light fixture.